Into the Khumbu, we woke this morning to a cloudy day and it remains so all day. Before leaving Khumjung, we had an opportunity to visit the Hillary school, the major school for the entire lower Khumbu region. We rejoined the main trekking path today after our diversion to Khumjung It is interesting to know, at one of the major branches in the trail there is sign pointing to the next major town from each branch. It is not measured in kilometers or miles, rather it measured in the amount of time it will take to hike the distance. But we have discovered the time is Sherpa travel time. Back on the main trekking route, we encountered many more travelers, among them are the porters who are the backbone of the economy in the region. They transport a lot on their backs and are much faster than we are. On the trail to Tengboche we cross the new bridge that replaced one that was washed out during the summer monsoon season. The new bridge; made of stone and wood was constructed in less than a month. After arriving in Tengboche, we ate lunch the tea house across from the major monastery, Tengboche. Also at the tea house was a group on their way back from Everest Base Camp. They reported there is no snow up there right now and that the weather is warmer than usually for this time of year. Following lunch we visited the Tengboche Monastery. Then we headed to the Tengboche bakery for a treat. No interesting trekker news to report today. We did a lot of uphill and that tends to decrease the chatter on the path. Everyone is making it, one step at a time. 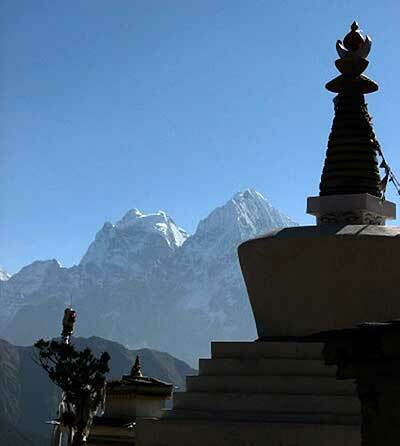 Tomorrow we will visit Deboche Monastery before heading closer to Everest Base Camp.